Today was the district conference for the Jinja area. It was wonderful. The first few days I was here I woke each morning half hoping that when I opened my eyes I would be home. Today is one of those days when I feel like three months here won’t be nearly long enough. I meet people and I want to get to know them, to be a part of their lives. I want to be apart of watching the church grow here. And there just isn’t enough time. I am starting to love being here, I don’t notice the smells so much anymore, My stomach has adjusted to the food, I am sleeping again. It’s all good again and I can begin to really enjoy this experience. The branch here hired a couple of buses to take us all to Jinja. When we arrived there were a whole bunch of missionaries waiting to greet us. I went and met them, several of whom were from Utah. The missionary couples and the Mission president were there as well. I got to meet the Mission president. He is leaving in just a few weeks and he was very emotional as he has been here for six years. As the congregation sang God be with you till we meet again, and he was waving to them from the stand, the whole congregation was waving back and he was crying. It was so touching. 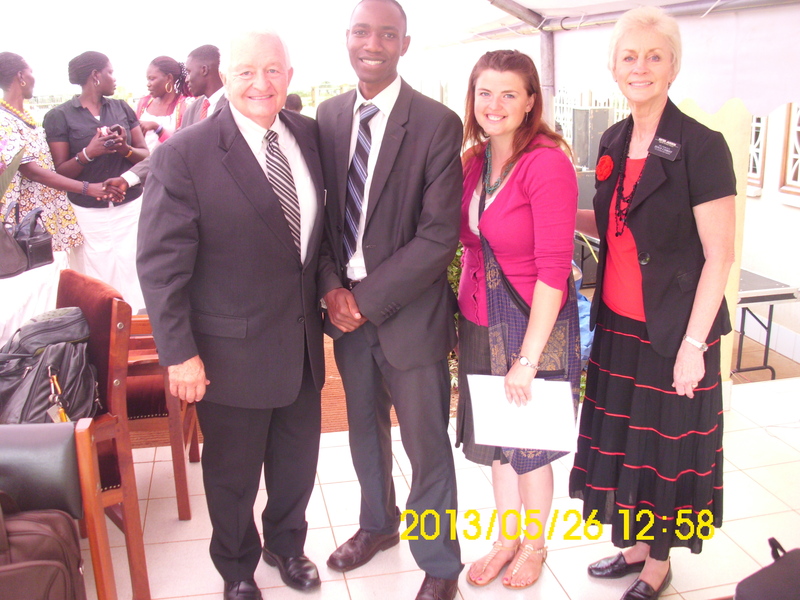 President and Sister Jackson with Emined and I.
Emined was the first Ugandan member that this mission president sent out. Now they have many. He was very excited to get to see him. As he shook his hand President Jackson said ‘Emined I started this off with you and I now I will end it with you” and he gave him a big hug. It is touching to see how much the people here love him and how much he loves them. I was amazed during the conference at how direct the speakers were. They talked about several issues that I happen to know are quite cultural issues. I would have thought they would be hesitant to address. But president Jackson was very clear about the fact that these things are chains that are still binding this people. They talked about bride price (the tradition of paying a large sum of money to the brides parents) and how the church was really discouraging this tradition. They talked about modesty and president Jackson said they had raised the expectations and that more was going to be required of these people. He talked about paying tithing and so many things and I left feeling that surely if these people could change so much and walk away from their traditions I can do as much to become a better person. After the conference So many members came and shook my hand and wanted to stay in touch and take a picture that if Emined hadn’t insisted that we needed to get going I don’t think I ever would have made it out of there. We went to a members home for dinner. 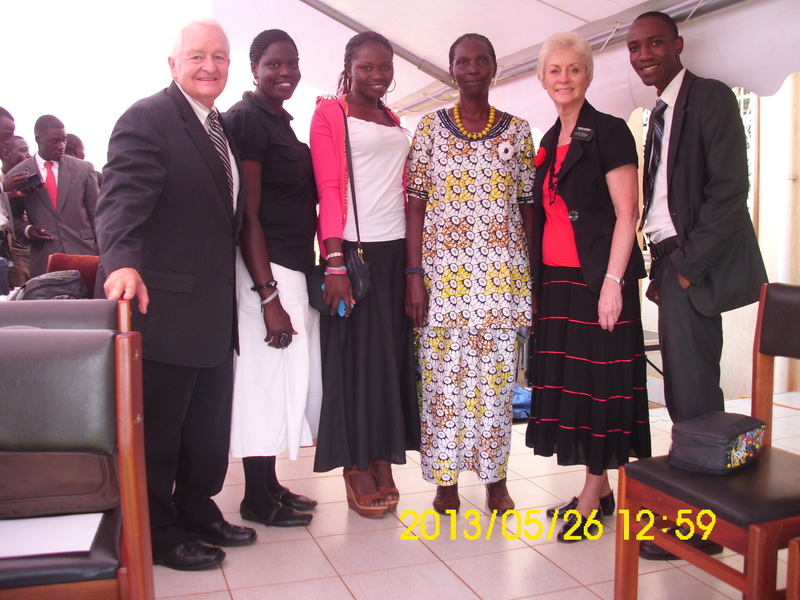 Sister Gertrude was one of the very first members in Uganda. She is an amazing woman who is a single mom. She has raised her daughters in the church and she is so strong. Her testimony is so vibrant and real only someone who has really sacrificed to live what they believe would be able to speak with the conviction that she has. Sister Gertrude and her two daughters with Emined and his mission president. She kind of adopted Emined. When he was just new in the church his family had disowned him and he had nowhere to go for shelter. She took him in and he stayed with her until he was able to get on his feet. She says he is her son and her home is his home. So we had dinner with her and her daughters. Her daughter recently served a mission and is a beautiful strong woman also. I think we will be good friends. And I look forward to knowing her. 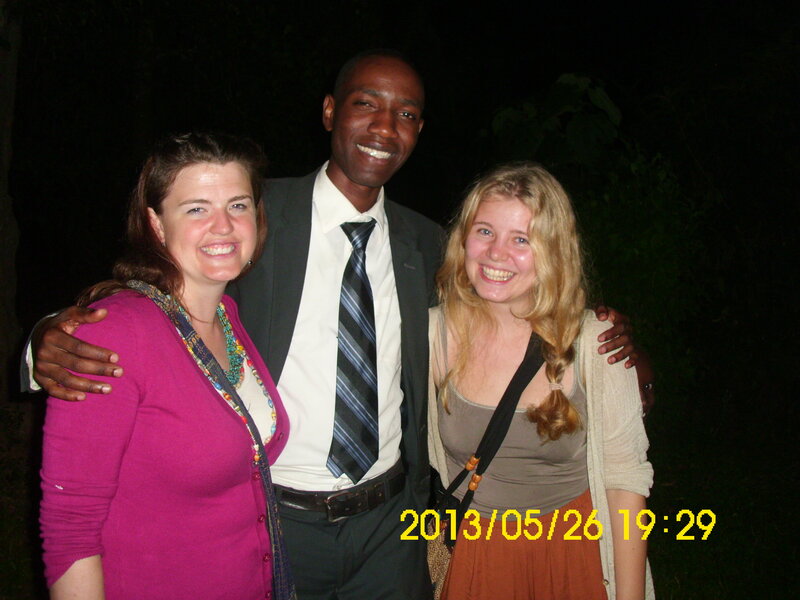 After dinner we rode back to Lugazi just in time for a little goodbye party for Ellen. We had a picnic at a little park just outside a local church. It was quite interesting to see the pastors there playing games with us and joking with Ellen who has been so vocal about being atheist. That is one thing that I love about Ugandans. You can disagree with them and have little arguments without anyone getting their feelings hurt. The pastor jokingly referred to Ellen as his enemy and asked me if now that she was going if I was going to be his new enemy. I told him that I didn’t think that was necessary. That in spite of the fact that our opinions differed a bit on religion we are still Heavenly Fathers children and we can be friends. He laughed good-naturedly and went on his way. This entry was posted in Family, Mormons, Travel, Uncategorized and tagged bride price, goodbye, mission president, Missionaries.